The Xerox iGen4 together with the Stora EnsoTM module is an automated solution for the digital production of cardboard packaging. For digital color printing is used Xerox iGen4 machine, UV or aqueous coating with varnish is manufactured by a company EPIC and Die cutting is developed by Stora Enso requirements. The overall system allows clients producing small runs of printed packaging. Since all modules are connected to a single line, we have maximum productivity when making packaging. For example, at the entrance to the system we insert a piece of paper / cardboard, and at the output we have printed and die- cutted packaging sheet, ready for folding and gluing. Color printing is in charge of the Xerox iGen4 machine with speed of 110 ppm, and it is a unique solution on the market for making printed packaging with format 364×571 mm, and soon is coming format 364×660 mm. The system is completed with an Epic CTi-635 machine for UV or aqueous coating, Stora Enso unit for collecting and transporting sheets and cutter developed by Kama for Stora Enso. The coating is required for many applications in packaging and gives a quick-drying, UV or based on water protection to package from dirt and scratches. Xerox solution Gallop helps protect the environment because it allows printing small runs on demand, reducing the unnecessary cost of materials, and uses cardboards that are recycled and can be recycled again. Steps in the process prior to printing – Digital printing eliminates steps and processes before printing (making films, lighting plates, assembly, and subsequent corrections). Digital printings is ideal for automating the entire procedure, thereby saving time, energy, manpower and reduce steps in production. Obsolescence of products – in all industries aim is to reduce waste and scrap. It is completely undesirable to have a lot of ready-made storage containers of ambalage that may never be used. Statistics show that 40-50% of printed material is thrown away because it will not be used or because the statute of limitations. Taking care of the environment – almost everywhere is present demand of caring for the environment and the use of recycled materials. The digital process reduces waste, saves material and energy, and therefore contributes to environmental conservation. Faster process – the traditional printing process for packaging can last for days. With digital, you can have finished packing for a few hours. The sample for testing – as is the cost to produce a single package the same as for a thousand, digital process is very favorable for the production of samples and test prototype packaging. Thus designers can also check how design influences consumers to choose the right product. Versions of packages – Digital printing is ideal for packaging that needs to be adapted to the local market, due to a specific geographic area of language, demographics, age group or even completely personalized. In the current economic crisis, all the manufacturers are looking for ways to highlight their brand and reach out to their target clientele. Gallop, Xerox iGen4 automated system for the production of cardboard packaging, is unique on the market. It is the only available system for inline digital manufacturing of paper and cardboard packaging. Approximately 10% of the production of packaging goes to small print runs. As the largest segment of the packaging industry of graphic production, it represents a huge potential. Gallop technology puts Xerox at the top selection of manufacturers for packaging small runs. 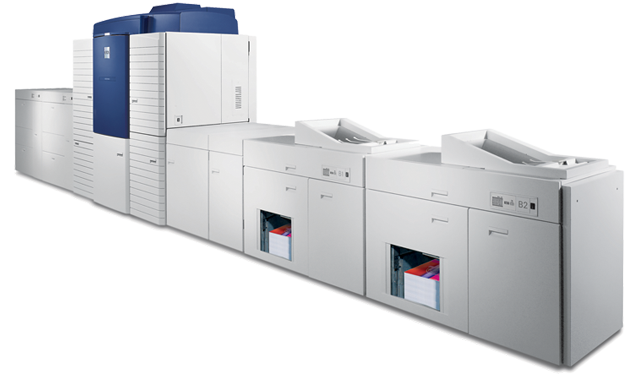 Xerox iGen4 digital system for color printing. 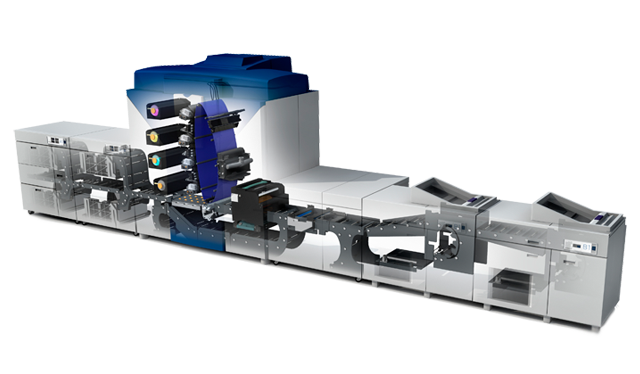 It uses a standard iGen4 system with various modifications in order to improve the printed media for packaging. However, these modifications are not only specific to Gallop system, but can be applied to every iGen4 machine. EPIC CTi-635 device for applying of coatings. This module is used to apply UV or aqueous varnish. It is applied to the paper after printing and it dries. It uses Coat-Tech technology similar to Anilox systems used in offset printing machines. With this is achieved coating on the entire paper or only in some selected areas. Module for the collection and transport. This module transports the printed sheets of paper / cardboard from EPIC module to die-cutter. In addition, it provides that the printing continues even when the die-cutter is not in use. It also can be used as a sort of final printed sheets. Stora Enso Gallop DC58A die-cutter. This is compact die-cutter which the company Kama specially produced for the Stora Enso Gallop system. Because of adaptable design the tool changes is simple and it is therefore better than traditional die-cutter. It has a vacuum gripper for optimal handling with all media. DC58A from printed sheets creates the desired format that is ready for folding and gluing. Die-cutter also has the option of cutting, perforating, and cold embossing and use of Braille. Option is that the system can be upgraded for hot foil stamping, combination of hot foil stamping and embossing and stamping holograms. The biggest advantage is that the change of tools and preparation between applications is tremendously quick and short: it takes only ten minutes!